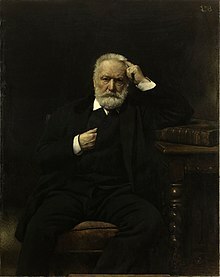 Victor Marie Hugo (26 February 1802 – 22 May 1885) was a French poet, novelist, and dramatist of the Romantic movement, widely esteemed as one of the greatest of French writers and poets. I represent a party which does not yet exist: the party of revolution, civilization. This party will make the twentieth century. There will issue from it first the United States of Europe, then the United States of the World. Social problems overstep frontiers. The sores of the human race, those great sores which cover the globe, do not halt at the red or blue lines traced upon the map. Behold, then, a new religion, a new society; upon this twofold foundation there must inevitably spring up a new poetry. Previously following therein the course pursued by the ancient polytheism and philosophy, the purely epic muse of the ancients had studied nature in only a single aspect, casting aside without pity almost everything in art which, in the world subjected to its imitation, had not relation to a certain type of beauty. A type which was magnificent at first, but, as always happens with everything systematic, became in later times false, trivial and conventional. Christianity leads poetry to the truth. Like it, the modern muse will see things in a higher and broader light. It will realize that everything in creation is not humanly beautiful, that the ugly exists beside the beautiful, the unshapely beside the graceful, the grotesque on the reverse of the sublime, evil with good, darkness with light. It will ask itself if the narrow and relative sense of the artist should prevail over the infinite, absolute sense of the Creator; if it is for man to correct God; if a mutilated nature will be the more beautiful for the mutilation; if art has the right to duplicate, so to speak, man, life, creation; if things will progress better when their muscles and their vigour have been taken from them; if, in short, to be incomplete is the best way to be harmonious. Then it is that, with its eyes fixed upon events that are both laughable and redoubtable, and under the influence of that spirit of Christian melancholy and philosophical criticism which we described a moment ago, poetry will take a great step, a decisive step, a step which, like the upheaval of an earthquake, will change the whole face of the intellectual world. It will set about doing as nature does, mingling in its creations — but without confounding them — darkness and light, the grotesque and the sublime; in other words, the body and the soul, the beast and the intellect; for the starting-point of religion is always the starting-point of poetry. All things are connected. Ces deux moitiés de Dieu, le pape et l'empereur! These two halves of God, the Pope and the emperor. God became a man, granted. The devil became a woman. À quelle heure, s'il vous plaît? At what hour, please? retort to Victor Cousin, after he claimed he could pinpoint the start of the (perceived) decay of the French language: 1978. Reason is intelligence taking exercise; imagination is intelligence with an erection. Unpublished notebook from 1845-50. Published in Seebacher (ed. ), Oeuvres Complètes, vol. 10, p. 158 (Laffont, 1989). English translation from Robb, Victor Hugo p. 249 (Norton, 1997). Vous avez des ennemis? Mais c'est l'histoire de tout homme qui a fait une action grande ou crée une idée neuve. C'est la nuée qui bruit autour de tout ce qui brille. Il faut que la renommé ait des ennemis comme il faut que la lumière ait des moucherons. Ne vous en inquiétez pas, dédaignez! Ayez la sérénité dans votre esprit comme vous avez la limpidité dans votre vie. Socialism, or the Red Republic, is all one; for it would tear down the tricolour and set up the red flag. It would make penny pieces out of the Column Vendome. It would knock down the statue of Napoleon and raise up that of Marat in its stead. It would suppress the Académie, the Ecole Polytechnique, and the Legion of Honour. To the grand device Liberty, Equality, and Fraternity, it would add “Ou la mort. It would bring about a general bankruptcy. It would ruin the rich without enriching the poor. It would destroy labour, which gives to each one his bread. It would abolish property and family. It would march about with the heads of the proscribed on pikes, fill the prisons with the suspected, and empty them by massacres. It would convert France into the country of gloom. It would strangle liberty, stifle the arts, silence thought, and deny God. It would bring into action these two fatal machines, one of which never works without the other—the assignat press and the guillotine. In a word, it would do in cold blood what the men of 1793 did in fever, and after the grand horrors which our fathers saw, we should have the horrible in all that was low and small. Vous tenez à l’exemple [de la peine de mort]. Pourquoi? Pour ce qu’il enseigne. Que voulez-vous enseigner avec votre exemple? Qu’il ne faut pas tuer. Et comment enseignez-vous qu’il ne faut pas tuer? En tuant. You insist on the example [of the death penalty]. Why? For what it teaches. What do you want to teach with your example? That thou shalt not kill. And how do you teach thou shalt not kill? By killing. A day will come when there will be no battlefields, but markets opening to commerce and minds opening to ideas. A day will come when the bullets and bombs are replaced by votes, by universal suffrage, by the venerable arbitration of a great supreme senate which will be to Europe what Parliament is to England, the Diet to Germany, and the Legislative Assembly to France. A day will come when we shall see those two immense groups, the United States of America and the United States of Europe, facing one another, stretching out their hands across the sea, exchanging their products, their arts, their works of genius, clearing up the globe, making deserts fruitful, ameliorating creation under the eyes of the Creator, and joining together, to reap the well-being of all, these two infinite forces, the fraternity of men and the power of God. Il y a maintenant en France dans chaque village un flambeau allumé, le maître d'école, et une bouche qui souffle dessus, le curé. Translation: There is now, in France, in each village, a lighted torch—the schoolmaster—and a mouth which blows upon it—the curé. Translation: In every French village there is now a lighted torch, the schoolmaster; and a mouth trying to blow it out, the priest. Variants: There is in every village a torch: The schoolteacher/teacher. And an extinguisher: The priest/clergyman. I only take a half share in the civil war; I am willing to die, I am not willing to kill. One cannot resist an idea whose time has come. Armies cannot stop an idea whose time has come. Waterloo! Waterloo! Waterloo! Dismal plain! The eye was in the tomb and stared at Cain. You have created a new thrill. For four hundred years the human race has not made a step but what has left its plain vestige behind. We enter now upon great centuries. The sixteenth century will be known as the age of painters, the seventeenth will be termed the age of writers, the eighteenth the age of philosophers, the nineteenth the age of apostles and prophets. To satisfy the nineteenth century, it is necessary to be the painter of the sixteenth, the writer of the seventeenth, the philosopher of the eighteenth; and it is also necessary, like Louis Blane, to have the innate and holy love of humanity which constitutes an apostolate, and opens up a prophetic vista into the future. In the twentieth century war will be dead, the scaffold will be dead, animosity will be dead, royalty will be dead, and dogmas will be dead; but Man will live. For all there will be but one country—that country the whole earth; for all there will be but one hope—that hope the whole heaven. Was it possible that Napoleon should win the battle of Waterloo? We answer, No! Why? Because of Wellington? Because of Blücher? No! Because of God! For Bonaparte to conquer at Waterloo was not the law of the nineteenth century. It was time that this vast man should fall. He had been impeached before the Infinite! He had vexed God! Waterloo was not a battle. It was the change of front of the Universe! C'est ici le combat du jour et de la nuit... Je vois de la lumière noire. Font vivre l'homme dix fois dix. Make a man live for ten times ten. Ce besoin de l’immatériel est le plus vivace de tous. Il faut du pain; mais avant le pain, il faut l’idéal. Je représente un parti qui n'existe pas encore, le parti Révolution-Civilisation. Ce parti fera le vingtième siècle. Il en sortira d'abord les États-Unis d'Europe, puis les États-Unis du Monde. I represent a party which does not yet exist: the party Revolution-Civilization. This party will make the twentieth century. There will issue from it first the United States of Europe, then the United States of the World. To divinise is human, to humanise is divine. The miserable's name is Man; he is agonizing in all climes, and he is groaning in all languages. In proportion as I advance in life, I grow more simple, and I become more and more patriotic for humanity. God manifests himself to us in the first degree through the life of the universe, and in the second degree through the thought of man. Vous avez raison, monsieur, quand vous me dites que le livre les Misérables est écrit pour tous les peuples. Je ne sais s'il sera lu par tous, mais je l'ai écrit pour tous. Il s'adresse à l'Angleterre autant qu'à l'Espagne, à l'Italie autant qu'à la France, à l'Allemagne autant qu'à l'Irlande, aux républiques qui ont des esclaves aussi bien qu'aux empires qui ont des serfs. Les problèmes sociaux dépassent les frontières. Les plaies du genre humain, ces larges plaies qui couvrent le globe, ne s'arrêtent point aux lignes bleues ou rouges tracées sur la mappemonde. Partout où l'homme ignore et désespère, partout où la femme se vend pour du pain, partout où l'enfant souffre faute d'un livre qui l'enseigne et d'un foyer qui le réchauffe, le livre les Misérables frappe à la porte et dit: Ouvrez-moi, je viens pour vous. You are right, sir, when you tell me that Les Misérables is written for all nations. I do not know whether it will be read by all, but I wrote it for all. It is addressed to England as well as to Spain, to Italy as well as to France, to Germany as well as to Ireland, to Republics which have slaves as well as to Empires which have serfs. Social problems surpass frontiers. The sores of the human race, those great sores which cover the globe, do not halt at the red or blue lines traced upon the map. 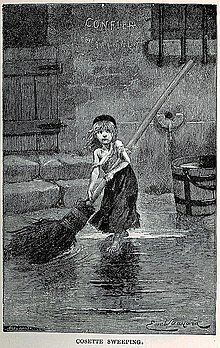 In every place where man is ignorant and despairing, in every place where woman is sold for bread, wherever the child suffers for lack of the book which should instruct him and of the hearth which should warm him, the book of Les Misérables knocks at the door and says: "Open to me, I come for you." At the hour of civilization through which we are now passing, and which is still so sombre, the miserable's name is Man; he is agonizing in all climes, and he is groaning in all languages. Quant à moi, j'ai écrit pour tous, avec un profond amour pour mon pays, mais sans me préoccuper de la France plus que d'un autre peuple. A mesure que j'avance dans la vie je me simplifie, et je deviens de plus en plus patriote de l'humanité. This book, Les Misérables, is no less your mirror than ours. Certain men, certain castes, rise in revolt against this book, — I understand that. Mirrors, those revealers of the truth, are hated; that does not prevent them from being of use. As for myself, I have written for all, with a profound love for my own country, but without being engrossed by France more than by any other nation. In proportion as I advance in life, I grow more simple, and I become more and more patriotic for humanity. In short, I am doing what I can, I suffer with the same universal suffering, and I try to assuage it, I possess only the puny forces of a man, and I cry to all: "Help me!" Whether we be Italians or Frenchmen, misery concerns us all. Ever since history has been written, ever since philosophy has meditated, misery has been the garment of the human race; the moment has at length arrived for tearing off that rag, and for replacing, upon the naked limbs of the Man-People, the sinister fragment of the past with the grand purple robe of the dawn. Homer is one of the men of genius who solve that fine problem of art — the finest of all, perhaps — truly to depict humanity by the enlargement of man: that is, to generate the real in the ideal. Que l'avenir soit un orient au lieu d'être un couchant, c'est la consolation de l'homme. Music...is the vapour of art. It is to poetry what revery is to thought, what the fluid is to the liquid, what the ocean of clouds is to the ocean of waves. They had done him the honor to take him for a madman, but had set him free on discovering that he was only a poet. It is very fortunate that kings cannot err. Hence their contradictions never perplex us. Cimourdain knew everything and nothing. He knew everything about science, and nothing at all about life. Hence his inflexibility. Cimourdain was a pure-minded but gloomy man. He had "the absolute" within him. He had been a priest, which is a solemn thing. Man may have, like the sky, a dark and impenetrable serenity; that something should have caused night to fall in his soul is all that is required. Priesthood had been the cause of night within Cimourdain. Once a priest, always a priest. Whatever causes night in our souls may leave stars. Cimourdain was full of virtues and truth, but they shine out of a dark background. Variant translation: What makes night within us may leave stars. Meaning:The absence of light does not extinguish the human spirit within, and even though their will be times that you will be tested of your ability you may come out even brighter than you were before. Even though you may have been left in the dark you willbe able to thrive through and become a shining star. Cimourdain was one of those men who have a voice within them, and who listen to it. Such men seem absent-minded; they are not; they are all attention. Cimourdain knew everything and nothing. He knew everything about science, and nothing at all about life. Hence his inflexibility. His eyes were bandaged like Homer's Themis. He had the blind certainty of the arrow, which sees only the mark and flies to it. In a revolution, nothing is more terrible than a straight line. Cimourdain went straight ahead, as sure as fate. Cimourdain believed that, in social geneses, the extreme point is the solid earth; an error peculiar to minds which replace reason with logic. He who is a legend in his own time is ruled by that legend. It may begin in absolute innocence, but, to cover up flaws and maintain the myth of Divine Power, one must employ desperate measures. 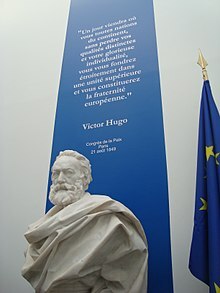 Though research done for Wikiquote indicates that the attribution of this remark to Hugo seems extensive on the internet, no source has been identified. It seems to be a statement a modern satirist might make, derived from one made circa 1910 by Mrs Patrick Campbell regarding homosexuals: "Does it really matter what these affectionate people do — so long as they don’t do it in the streets and frighten the horses?" And the navy, Papa, will come to Malta. Palindrome attributed to Hugo on the internet, but in no published sources yet found. Il y a quelque chose de plus puissant que la force brutale des baïonnettes: c'est l'idée dont le temps est venu et l'heure est sonnée. There is something more powerful than the brute force of bayonets: it is the idea whose time has come and hour struck. Hugo, like a priest, always has his head bowed -- bowed so low that he can see nothing except his own navel. ↑ Aimard, Gustave; (tr. unknown) (1861). The Freebooters. London: Ward and Lock. pp. 57. ↑ Aimard, Gustave (1861). Les Francs Tireurs. Paris: Amyot. pp. 68. This page was last edited on 30 March 2019, at 21:11.